Our communities are our lifeblood. It is where we spend most of our lives – going to school, going to work, spending time with friends and families, enjoying the things our neighborhoods offer us. But despite the love we have for our communities, sometimes we outgrow them. We get new jobs, new families, or new opportunities to change things up in our lives. Sometimes, our communities also outgrow us. Moving is hard, but almost everyone will move at least once in their lives. If you’re looking for a new community, but don’t want to go too far from the old – look no further than the Hudson Valley. The Hudson Valley has everything you could want when moving to a new community. Looking to lower your property tax rate? Check that off the list. Hudson Valley cities and towns boast much lower property taxes than both Rockland County (#2 nationwide) and Bronx County. In the Hudson Valley, you can still easily commute to and from Rockland County or New York City. There’s no shortage of public transportation and using your own car is just as easy. If you feel that you’re going to miss out on life near the big city, fear not! The Hudson Valley hosts many vibrant, growing cities. Some residents feel that folks from Brooklyn are bringing a unique, hip vibe to the Valley, but according to Hudson Valley Magazine, the Bronx and Manhattan contribute twice as many New York relocations than Brooklyn. It’s almost inevitable that you will run into someone from the old neighborhood after you move to the Hudson Valley. Maybe you’re trying to get away from the big city. 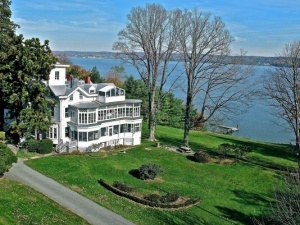 The Hudson Valley is a perfect destination for your move. Nestled between the Catskills and New York, you can have the best of both worlds – that upstate quaintness, with its placid, peaceful outdoor scenery and the ability for a quick jaunt to New York City if you’re feeling restless. When you move to the Hudson Valley, you’ll quickly notice a bustling local craft and art scene that is growing all the time. The quiet atmosphere of the lands west of the Hudson lends itself to creative pursuits. The bacchanalia of beer, wine, and food festivals always abounds, especially in the warmer months. And if you have kids, there’s no doubt you’ll be looking at the schools and safety of the Hudson Valley. You’ll be pleased to know that 38 of the top 50 safest cities are in the HV according to the National Council for Home Safety and Security (NCHSS), with the Town of Highlands coming in at number one. Not only is the Hudson Valley safe, its schools are also top-notch, with 38 districts ranked within the top 100 in New York state according to a 2018 Niche study of the best schools in New York. Safe neighborhoods and good schools also tend to mean that the real estate market in the Hudson Valley is generally very good. When you move to the Valley, you’re making an investment in the community, but you’re also making an investment for yourself in the form of your property, your house, your family and your home. This investment will pay off immensely for your well-being, knowing that you are comfortable and secure in the perfect location to live, work, and play. Convinced yet? The realtors at IPG Real Estate can help you find your dream home, if you’re thinking about moving to the Hudson Valley. There are many properties available – just give us a call when you’re ready.